This is a sponsored post written by me on behalf of Blue Bunny Ice Cream. All opinions are 100% mine. November is National Diabetes Month. While I don’t have diabetes, it’s definitely touched my life in many ways. When I was a little girl, my mom dated a man with a diabetic daughter. Back then, we really didn’t have many tasty sugar-free options. I always felt really guilty eating anything sweet in front of her, so I used to go without too. Now, my former father-in-law is living with diabetes. Boy does he ever have a sweet tooth! I know it’s hard for him at times, feeling deprived of all his favorite treats. Thanks to Blue Bunny® Sweet Freedom, no one with diabetes has to feel deprived. If there’s one thing I know, it’s ice cream. I love it. So much so that my ex-husband used to cringe when we got to the ice cream aisle. I would spend twenty minutes trying to decide which flavor I wanted! I’m not a plain ice cream kind of girl. I like “stuff” mixed in with the creamy goodness. I consider myself quite the ice cream connoisseur. 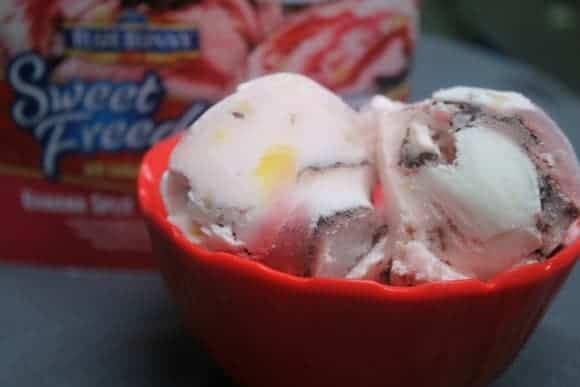 When I tried out several of the Blue Bunny® Sweet Freedom flavors back in June, I did it with an open mind. Still, I admit I was skeptical about sugar-free ice cream. Not only was I totally wrong to be skeptical, I even discovered a new favorite! See, in the past, I never would have thought to try the Banana Split flavor had it not been for a review. I was never a “fruit in ice cream” kind of gal. But WOW, let me tell you, it’s awesome! So much goodness going on in one scoop. Each bite is different. You may get a bit of strawberry-banana with your chocolate ribbon, or a couple of the mixed nuts with a pineapple chunk. Perhaps a cherry and some chocolate. You just don’t know! It’s like the ultimate ice cream for people like me who want full taste-bud engagement. One thing I DO know: you DON’T miss the sugar. At all. Blue Bunny® Sweet Freedom isn’t just a sweet treat during National Diabetes Month, it’s the perfect way to treat yourself year-round. Obviously, as with all treats, moderation is the key. A healthy diet and lifestyle is vital to keeping your diabetes under control. It’s also important to find ways to satisfy your sweet tooth so you don’t feel deprived. Take it from someone who really knows her ice cream, you will never feel deprived with Blue Bunny® Sweet Freedom. With so many delicious flavors to satisfy every taste bud, you’ll also never get bored! Visit Blue Bunny to check out all their delicious flavors and products. Check out their fabulous Pinterest board for visuals, inspiration and fun quotes. Follow them on Facebook to keep up with news. Have you tried Blue Bunny® Sweet Freedom yet? What is your favorite flavor? Sugar free ice cream has came along way! Looks delicious! I’ve never heard of this company before, but I’ve got to look for their products! Both my Mom and I are diabetic and I definitely miss eating ice cream! This is so great! My step son cant have regular ice cream because of the sugar. I have some friends who are diabetic so I will share with them about Blue Bunny. I might try this out for myself it looks just like regular ice cream but healthier. I didn’t know it was National Diabetes Month. My dad has had uncontrolled diabetes for years and now he had diabetic neuropathy. This looks like a great way for him to sate his sweet tooth without raising his blood sugar too much. This icecream looks delicious! It is good to know that companies are taking steps further to offer sweet products without all the sugar. I love their treats. Big ice cream fans right here! Blue Bunny makes some great ice cream! I love the crunchy popsicles. I have not tried that one yet, but I do like Chocolate, and Pistachio! the fact that they put out something so good for people watching their sugar intake blows me away! I wouldn’t have tried the banana split either. Who knew? I love their cheesecake ice cream, oh my gosh, it’s good. I first tried Blue Bunny ice cream years ago when I was focused on losing weight. They’re so yummy! You know what, I haven’t tried ANY BlueBunny at all! I guess I’m behind the curve! I’ve never heard of this before! Looks delicious! I love ice cream I don’t eat nearly as much of it as I use to but my favorite is Strawberry. This is just one of the brands that I buy when I go icecream shopping. It’s not my favorite but the kids love it. I love their sugar free ice cream! Looks yummy, but thank god I can eat the real thing. My grandma is diabetic, I will have to let her know about this! Hopefully it doesn’t have the thing that diet and other sugar free stuff has in it, she refuses to eat/drink anything with this one certain word that she can’t pronounce. haha Gotta love her though! we like blue bunny ice cream.. they have all good favors. I love Blue Bunny ice cream treats. We eat them all the time. We love Blue Bunny ice cream! I’m glad to hear they have an option for people with sugar problems.